The only country outside of the U.K where the skinhead cult spread to during the first generation of skins was Australia. The images of skins in sunny, laid-back and unfashionable Australian cities make a stark contrast to the grey council estates of England, and London, full of the latest, cutting-edge fashions. Skinhead was brought to Oz at the end of the sixties/start of the seventies by English immigrants, who came over as part of the ten-pound-pom scheme, an assisted immigration plan where it was cheap for people from the U.K to come here, but expensive for them to leave. This was part of the racist 'White Australia' policy, which encouraged immigration from white countries. 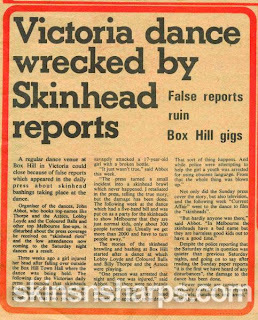 Skinhead reggae never reached Australia, but 'skanking' (reggae dancing) was brought over by the poms, and taken up by fashionable kids. Most of what was skinhead fashion in the U.K was unavailable over here. Aussie skins were skins in the basic look and attitude: trouble-making kids with cropped hair, boots, braces and Levi's jeans. Like in the U.K, there was plenty of media hysteria over skinhead violence. The article below describes how a girl falling over and injuring her head was elevated by the media into evidence of an epic skinhead brawl. IN EARLY 1968, WHEN I WAS A 16-YEAR-OLD “MOD” WORKING AT THE MELBOURNE GPO (POST OFFICE), I BECAME MATES WITH A YOUNG LOUT FROM PRESTON. HE HAD SHORT HAIR AND ATTITUDE! ONE LUNCHTIME, HE ASKED ME IF I WANTED TO COME OVER TO THE “SEVEN LITTLE TAILORS” SHOP ON ELIZABETH STREET. HE WAS GETTING SOME “FLAGS” MADE. WHEN WE GOT THERE, I FOUND OUT THAT “FLAGS” WERE A NECESSARY ITEM OF CLOTHING WORN BY A MELBOURNE-BASED GANG SUBCULTURE CALLED “SHARPIES”. THEY WERE TROUSERS–BAGGY TROUSERS–MADE OF WOOLEN MATERIAL IN “HOUNDSTOOTH” OR CHECK DESIGN WITH DULL COLOURS AND REAR POCKET FLAPS. I WAS INTRIGUED. I WANTED TO KNOW MORE! MY NEW MATE INFORMED ME THAT ALONG WITH FLAGS, THEY WORE ITALIAN FINE KNIT CARDIGANS AND JUMPERS MADE BY COMPANIES LIKE “VENITO”, NO STRIPES, JUST PLAIN COLOURS USUALLY MAROON OR BOTTLE GREEN. MODS WERE STARTING TO SOUNDS A BIT “OLD HAT” NOW. I WAS HOOKED! ITALIAN LEATHER SHOES, CHISEL TOE, CUBAN HEEL, WERE THE OTHER REQUIRED ITEMS OF CLOTHING AND A “CRESTKNIT” POLO SHIRT TO TOP IT OFF! SHARPIE GIRLS WERE CALLED “BRUSH” AND WORE FAIRLY DRAB OUTFITS COMPARED TO THE BOYS: TWIN SETS, PLAINT SKIRTS, FLAT SHOES, ETC. A FEW MONTHS LATER, I WENT TO A DANCE ON FLINDERS LANE CALLED “TRAFFIK” TO SEE “THE LOVED ONES”. AND WHO WERE HANGING AROUND OUTSIDE, LEANING ON LOWERED “HD” AND “EH” HOLDENS WITH “TASMAN” MAGS? SHARPIES! I LATER FOUND OUT THAT MOST DANCES HAD “SHARPIE BANS” SO THEY WOULD STAY OUT THE FRONT “PICKING” THE LONG HAIRS OR TRYING TO CHAT UP SOME MOD “CHICKS”. FUN! The same as in the U.K, Aussie kids were reacting against fancy mod haircuts and fashion and developed a more simple, tough look. As sharpies and skins had similiarities in fashion and attitude the styles influenced each other, and basically merged. Sharpies wore braces, and skins wore the sharpies' famous tailor made cardigans. 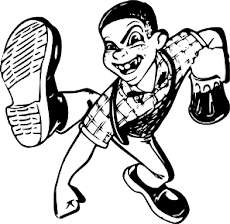 The sharpies' dance style was influenced by skanking. Sharpies' main difference was their proto-mullets: hair cropped all over except at the bottom of the back of the head, where they grew it long. Male sharpies were the first male, western, youth to have pierced ears. 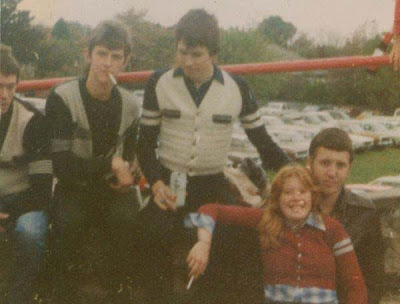 They were the first Australian subculture based around a uniquely Australian fashion style. Apart from the braces, they were not trying to emulate the fashion of another country. The most interesting aspect of sharpies was the level of creativity: cardigans, shoes, t-shirts, and sweaters were tailor-made, while jeans were store-bought but taken to the tailor for alterations. The cardigans and t-shirts often featured patterns designed by sharpies. Due to violence between sharpie gangs, and changes in fashion, the sharpie subculture gradually faded and dissappeared by the eighties. I liked this a lot. There is not that much information in Canada and the States about the sharpies, so reading something like this fills in a lot of the blanks. As a sharp in the late 60's and early 70's in Sydney most started with tight jeans, work shirts, braces, donkey or heavy wool jackets and hob nail boots. Fashion clothes weren't worn till early 70's when a more skinhead look came in. None of my gang knew anything about racial predujice as we had all nationalities in the gang. We were just louts and thugs looking for trouble dressed alike and enjoying life. Most of us were poorly educated, unemployed and just bored with life like our parents. Brilliant site! I've long been fascinated with the Sharpie movement, still clamoring for a copy of "Top Fellas", stay sharp! 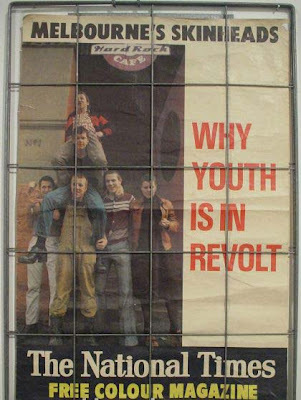 There were skinheads in the Republic of Ireland in the late 60's and early 70's. So you're wrong about Australia being the only country outside the UK the original skinhead cult spread to. I need to find a pair o Venus shoes made back in the mid 70s made by a shoe maker in Richmond at the time.